This post marks the start of a new project to create a collection of free online resources, involving a range of authors, about the links between writing and teaching. The initial focus will be on author visits to schools, but I’d like to expand eventually to include creative writing and teaching at university level, and also in more informal circumstances, like workshop series in libraries and so forth. If you’re a published author and you’ve done at least one school visit, do get in touch (via Twitter @AlexiaCasale or a comment on any part of this blog) if you’d be interested in doing a guest post (more info below). So there did this all come from and why is it A Good Thing? Last week I did my first ever school visit as an author. Huge thanks to Uxbridge College (my old school) for having me back to do an AS English Lang. & Lit. lecture! There are seminars (NAWE recently had one that sounded brilliant). And there are resources (again, NAWE have a long list) BUT most you have to pay for, with no opportunity to ‘see inside’ to check whether the advice is going to be worth it. And most are written by a single author, so at best you know you’ll be buying one point of view. There are also some good individual posts on individual author websites. BTW, do let me know about your favourite existing resources! I’d love to collect some links. What I have yet to find is a collection of free resources that explores different perspectives. I think this is a pity. I find this lack particularly surprising as, having spent three years working part-time to qualify as a teacher (PGCHEP – the university-teaching equivalent of a PGCE) and Higher Education Academy Fellow, I was hugely impressed by the central role professional development is accorded in teaching programmes. These programmes aren’t just about qualifying but understanding that you can always improve – and should strive to do so. That’s very attractive to me as a writer as the same principles apply: there is no end point where a writer has perfect mastery of the craft, no matter how brilliant he or she may be. Just because authors don’t have to be qualified to do school visits – or, indeed, to teach at university or in libraries or other circumstances – doesn’t mean they aren’t committed to doing a good job… and that they don’t need or want opportunities for professional development. And, at the very least, a decent selection of free resources to start with. Anyway, the plan here is to try to create what I think is missing. If you’re a published author and you’ve done at least one school visit, do get in touch if you’d be interested in doing a guest post. I am particularly interested to hear from authors who are also school teachers or university tutors/lecturers. As I said above, I’d also love to explore the other side of the coin with some guest posts from the perspective of teachers who regularly work with authors. So that’s the plan and the reasoning behind it! First post coming soon. 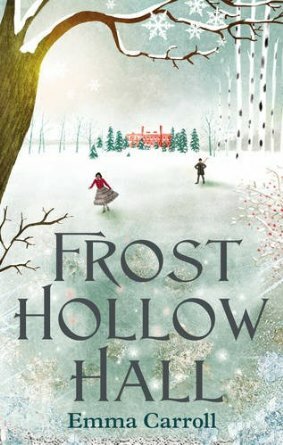 The lovely Emma Carroll, author of forthcoming Frost Hollow Hall (Faber & Faber, 3 October 2013), offers a brilliant workshop outline for teaching an English Literature creative writing class on how to write like a Victorian. Fantastic fodder for discussing classics from the Victorian age versus modern historical fiction, as well as getting your students to start dabbling in their own creative historical projects.